Here are some facts about Notre-Dame Cathedral. Notre-Dame Cathedral is located in Paris, France on the Ile de la Cite, the very heart of the city. It is one of the largest religious buildings in the world. Notre Dame is still a functioning Catholic church and the site of many important religious and ceremonial events. It’s also one of the most popular attractions in France, with 13 million visitors each year. The cathedral was built between 1163 and 1345. 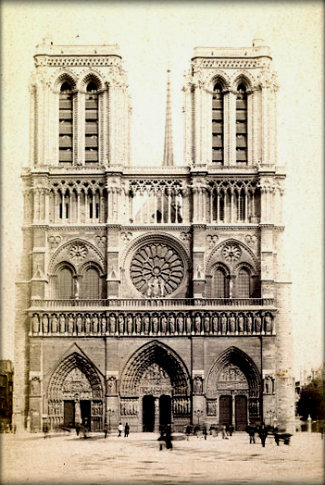 During its construction, many different architects and designers introduced new elements, including the cathedral’s innovative flying buttresses. Notre-Dame is almost 400 feet long, and about 140 feet wide. The famous twin towers at the front are 200 feet high and have 387 steps from the ground floor to the top. Although built of stone, an estimated 1,300 trees were also used in the cathedral’s construction and Notre-Dame is sometimes known as ‘The Forest’. The roof is made from over 1,000 lead tiles. The cathedral actually belongs to the French government, because of a law dating from 1905. The government has given the Church permission to use the building. Notre-Dame Cathedral is also the home of one of the world’s largest organs, and several huge church bells. The bell in the south tower is named Emmanuel and weighs 13 tons. One of the most revered of religious artifacts, the Crown of Thorns, is kept in the cathedral. Ceremonies venerating the relic take place during Easter and throughout the year. One of the world’s most well known books was set mostly in the cathedral. Victor Hugo’s The Hunchback of Notre Dame was written to increase appreciation for the building. Notre-Dame Cathedral is properly called Notre-Dame de Paris (Our Lady of Paris). 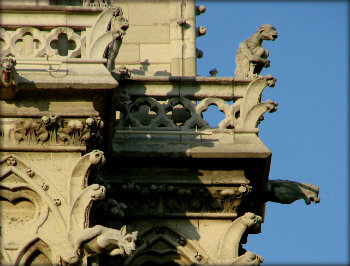 Many statues can be seen on the outside walls of Notre-Dame, and gargoyles and chimeras were added to serve as decorative water spouts. this has helped me on my homework,thanks. this has really helped for my french assignment. thank you!!! this has really made my project a lot better! This helped me so much with my French homework! Thanks for the information! Really helped me make my presentation/flipchart really better! Thanks for the information it really helped me in my project. This has really helped me with my history project. Thanks!!! Wow thx! This really helped with my France project! Thank You so much. This makes my French home work way easier!! Thank you. You really helped me with my homework. This really helped me with my homework. Thank you!!! !